To celebrate the release of Disney•Pixar's COCO DVD coming up next week, I thought it would be wonderful for my daughters to do something that celebrates life and our family. I want my children to be able to express the fun in our home as well as keeping our family traditions alive. Basically, what keeps our family going all year long . . . traditions that I have carried into our own little family. Coco focuses on two familiar themes: the importance of family and the power of music. I like to think that we have both of these as well. As Midwestern Americans, our culture might be a bit different from other area's cultures in the United States. Other cultures and people are pretty awesome in our amazing world. Disney•Pixar's COCO is an adventure of a lifetime movie and will be released on DVD February 27th. The characters of Disney•Pixar's COCO embrace their rich culture and family history as they embark on a wondrous adventure filled with mystery, magic, music and fun. Different cultures remember their ancestors differently and I thought this would be a good great opportunity to honor our ancestors and learn more about who has passed away in our family. My children have never met my father or his parents, my grandparents, as my father and grandmother passed away when I was 18 years old. But they love when I share stories about my father and grandmother; so I gathered up some photos of my father and told a few stories from my youth. Coco delivers the same unmistakable message that cherishing our family and remembering those who have passed on are important. 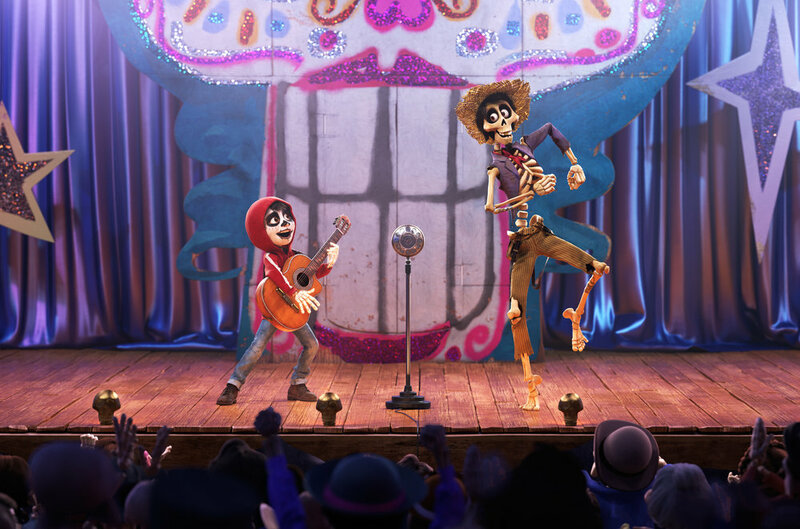 Music is shown to be positive, life-giving force in Coco, even though Miguel's family is very much against music. My daughters have been playing the violin(s) going on 8 years now. They play in our church quite often, they volunteer to play at a local nursing home for residents, they are both involved in our community youth orchestras and chamber programs and they continue to take private lessons. It is certainly a time commitment for our family, but I also believe music is a positive force! My father played the piano as well as the violin and I think my daughters inherited their love of music from him. In Coco, the Día de los Muertos is celebrated, the annual Day of the Dead. The Day of the Dead is a huge celebration. In this Mexican tradition, the living honor the dead at cemeteries one special day of the year. They bring photos, food and gifts to their ancestors, who they believe are there in spirit. The Day of the Dead celebrations include a local music contest which Miguel wants to compete. Sadly, his grandmother smashes his instrument. Miguel still wants to compete in the contest, so he comes up with a plan. To steal a famous guitar from a musician's crypt. He faces dire consequences and is transported to the Land of the Dead. This is a very vivid and imaginative place! But, Miguel is not actually dead, so it's not an ideal spot for him to be in and he wants to return to the land of the living. A wonderful story unfolds! The theme of Coco, the importance of family and the power of music continue throughout this great movie! Disney•Pixar’s “Coco”—the story of a 12-year-old aspiring musician’s extraordinary journey to the magical land of his ancestors. Through fresh and fascinating bonus material, adventurers of all ages will tag along with filmmakers as they soak in Día de los Muertos in Mexico; explore the essential role of music in “Coco;” and learn how the cast and crew personally connect with the film’s message. They’ll step behind the scenes to discover the inspiration behind the film’s creative costuming; Miguel’s beautifully complicated family; Dante the loyal Xolo dog; and the stunning worlds of both the dead and the living. Coco has extensive bonus materials on this DVD that includes deleted scenes, story research in Mexico and how they designed the world of the Land of the Dead. There is so much extras included, the whole family will find hours of content to enjoy! Disclosure: I received one DVD for review purposes only. I have not received any compensation for this post. My opinions are 100% my own.